It’s pretty hard to look at any health-related article these days, without seeing the microbiome mentioned at least once! And for good reason. The microbiome (or flora) is the sum total of all the critters that live in your gut (and skin, vaginal tract etc.). By critters I mean bacteria, viruses, yeast, fungi, parasites. There are about 100 trillion microorganism cells in/on our body – which is about 10 times the amount of human cells we have. So what that means is we are more bacteria than we are human! Fermented foods are the original probiotic. In an effort to preserve vegetables and have them last through the winter, humans started to ferment them. With the advent of refrigeration, we stopped needing to ferment veggies to preserve them. Unfortunately we didn’t realize how much we actually needed the byproduct of fermentation – probiotics. So why consume fermented foods if you can take a probiotic? Well, the top of the line, highest quality probiotic supplements usually contain between 4-10 strains of bacteria. Homemade sauerkraut can contain between 50 and 500 different strains. And what’s most important for creating a healthy gut microbiome, is variety and frequency. So choosing a variety of different types of foods – fermented vegetables like sauerkraut, homemade yogurt (either grassfed dairy or coconut) and kombucha – on a daily basis is a fabulous way to constantly be reinoculating your gut with a wide variety of beneficial critters. Kombucha is one of my favourite fermented foods – mostly because it tastes way more like a treat, than a ferment like sauerkraut. Full disclosure, it’s not nearly as rich in numbers or variety of bacteria, but it does have one good thing going for it. It’s filled with beneficial yeast, who do an awesome job at keeping opportunistic yeast (like Candida) from overgrowing. 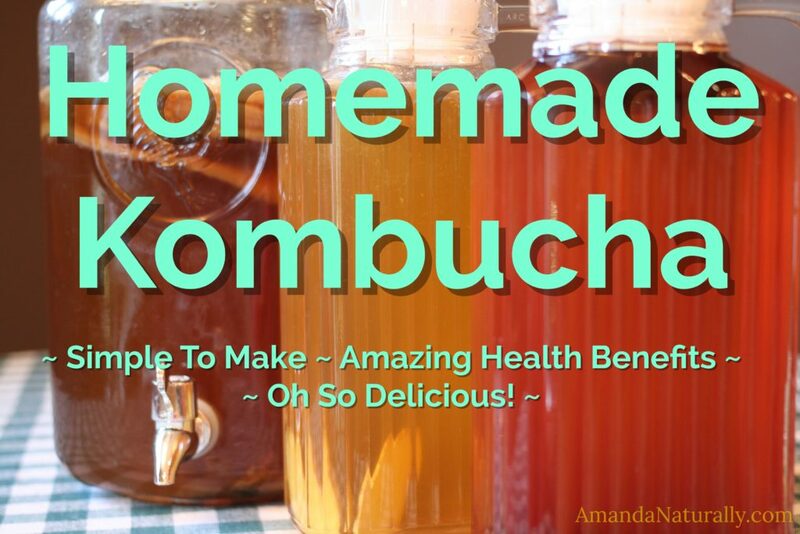 So while I love the ‘booch, I don’t recommend relying on it as your main source of probiotics. NOTE: during my first trimester my sour taste buds were like on steroids. Salad dressings, grapefruit, even romaine lettuce were painfully sour. So you can imagine what fermented veggies were like. The only fermented food I could tolerate was kombucha! As much as I love kombucha, it can get real expensive. A bottle of GT’s (a popular brand) ranges from $3.70-$4.99 – which adds up quick! So when I started consuming ‘booch regularly (instead of just as a treat), I knew I had to make my own otherwise I’d drink us out of house and home! It took me a while to get a routine going, and there are lot of variations out there, but this is how I do it and I’ve been very successful for months now! 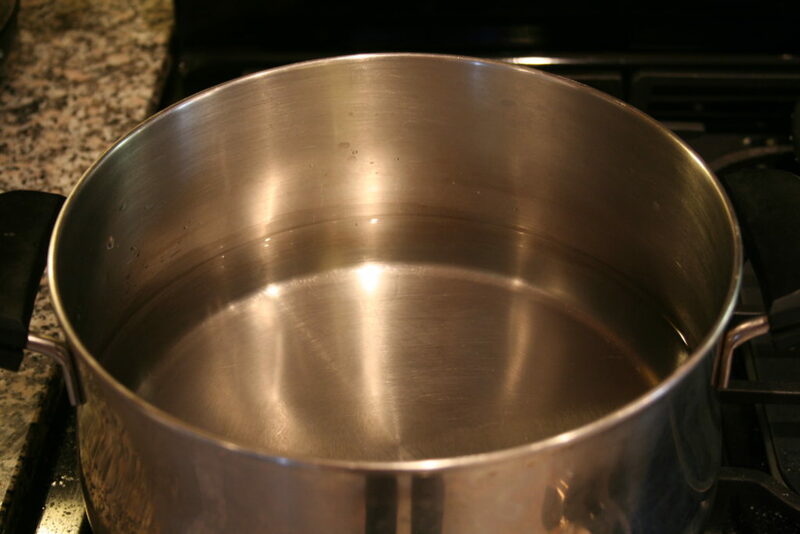 Boil 2 cups of the water in a small pot. 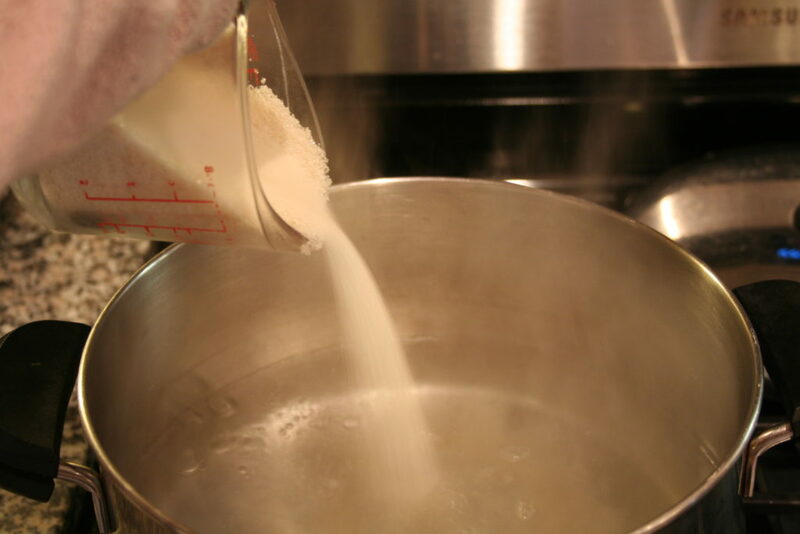 Once boiled, stir in the sugar until fully dissolved. 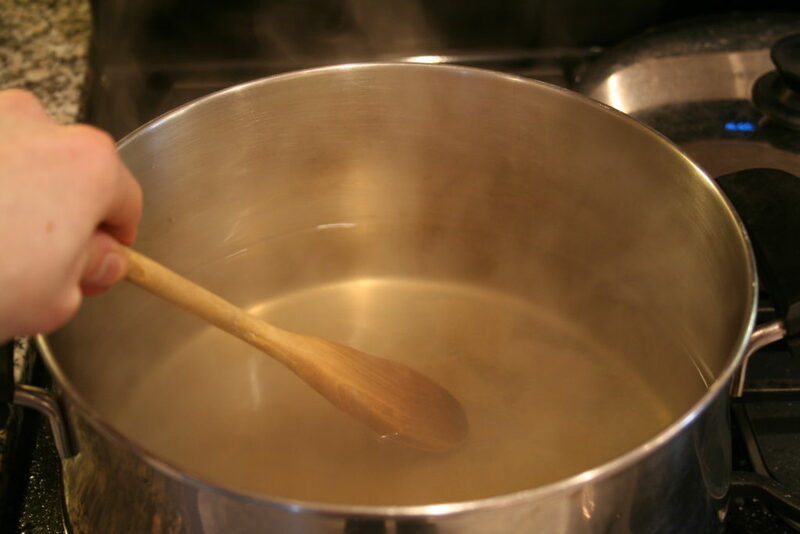 Add remaining 2 cups of water (to help speed up the cooling down process). 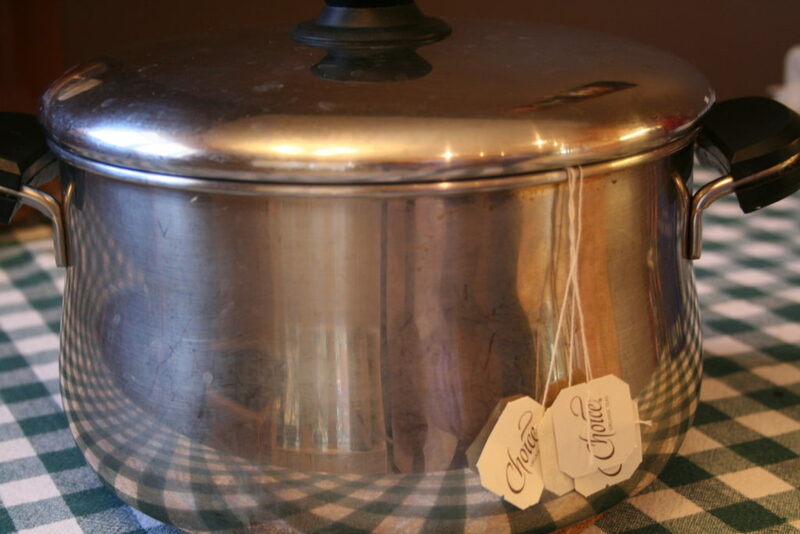 Cover the pot with a lid and let cool to room temperature. You can put it in the fridge for a few hours to help speed up the process, but don’t let it get too cold. 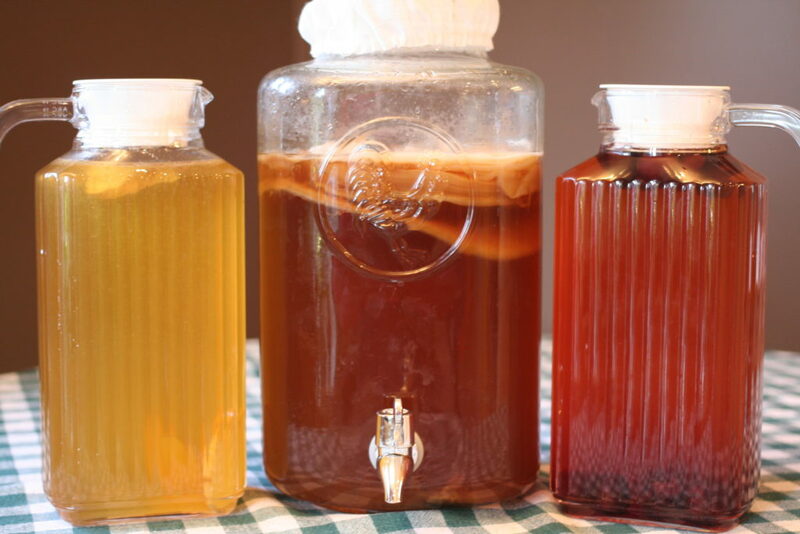 Once it’s at room temperature, pour the sweet tea into a clean jar, add the SCOBY and kombucha from a previous batch. Cover with a coffee filter or dish towel and let sit in a cool, dark place for 2 weeks. 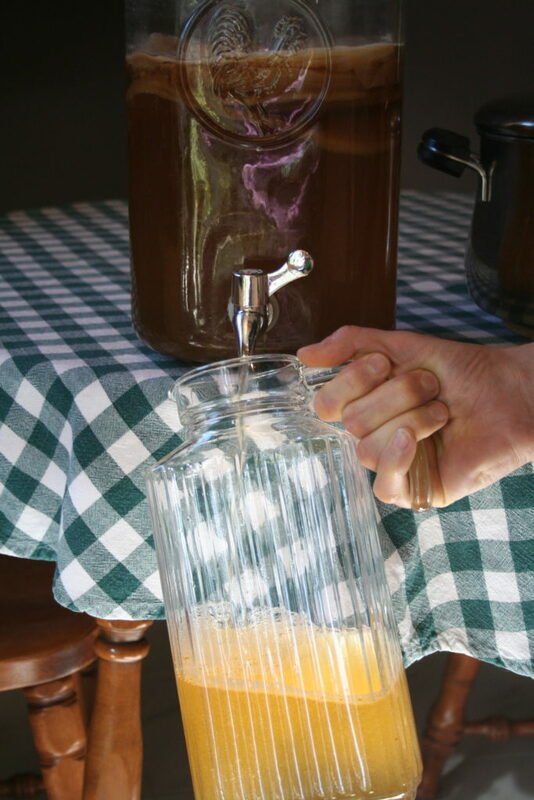 Once the 2 weeks are up, pour off almost all of the kombucha into a separate jar or juice jug, retaining enough to make another batch. You have the option to do a 2nd fermentation at this point, but I didn’t like the hassle so I don’t do it. Feel free to google it if you’re interested in a more fizzy beverage! 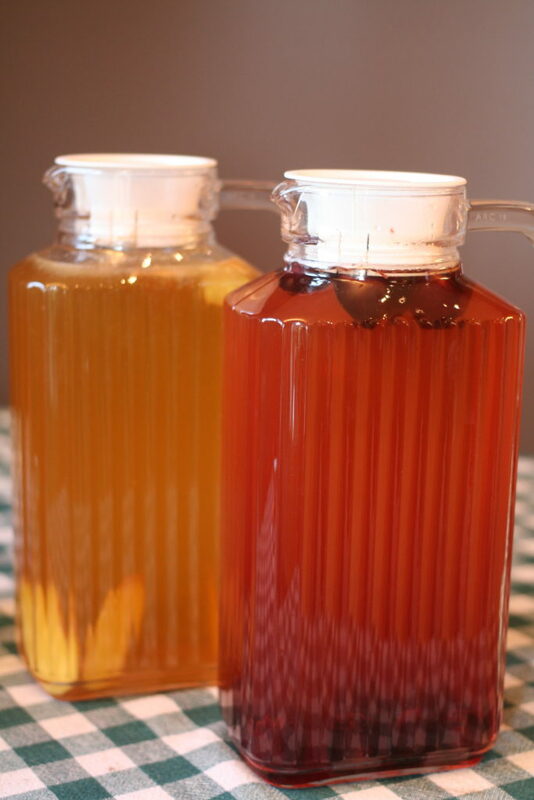 Store kombucha, with the flavouring in it, in the fridge! Meanwhile, repeat Part 1, with the leftover kombucha you retained. Every other Friday I make a new batch of kombucha. I start with Part 1, but since I have an old batch going, as soon as the new sweet tea is cooled to room temperature, I begin Part 2. I empty out most of the 2 week fermented kombucha into juice jugs with flavouring, leaving the SCOBY and enough kombucha in the bottom for the next batch. 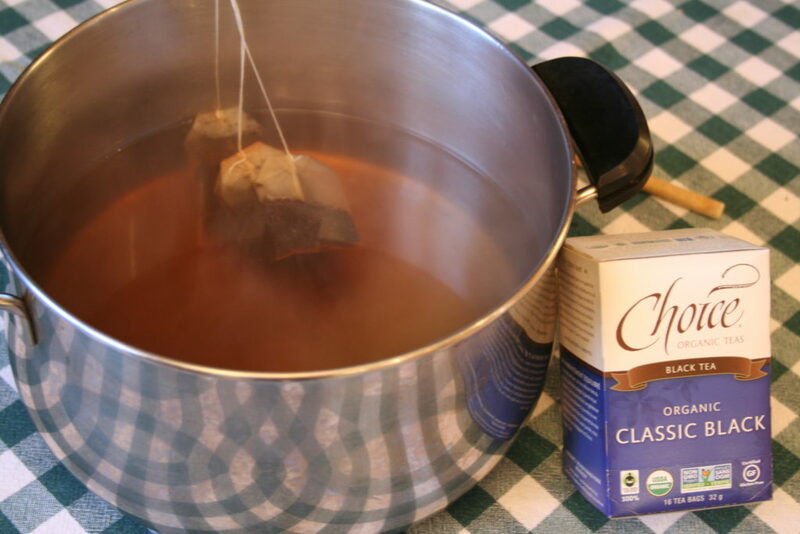 Then I pour the cooled sweet tea in and recover. Takes me about 20 minutes (plus a few hours wait time) every 2 weeks. 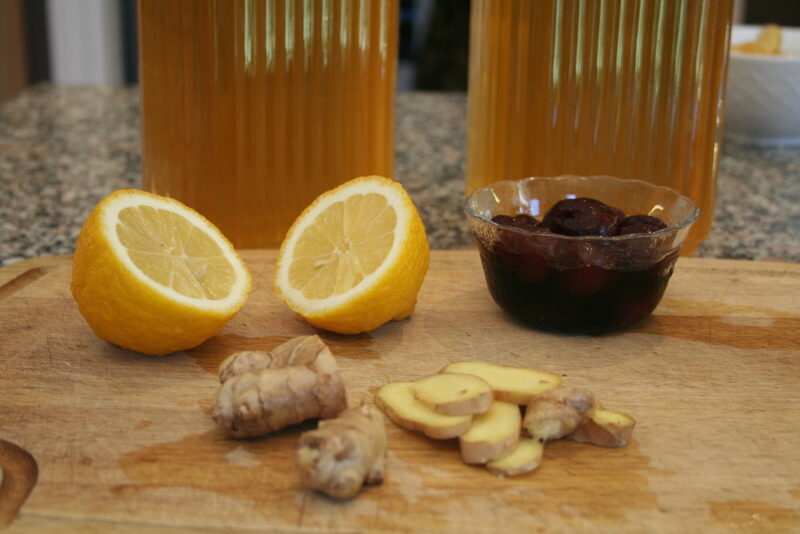 Start tasting the kombucha after 1 week to make sure you achieve your desired flavour. The goal is to have most of the sugar gone, so it shouldn’t be super sweet. But it also shouldn’t be vinegary. Don’t increase the size of your batch too quickly. I did and it resulted in a mouldy mess because the SCOBY wasn’t big enough to handle the sugar and keep the opportunistic microbes at bay. Start increasing slowly. Start with 1L, then do 1.5L, 2L, 3L etc. I now follow the exact ratio above, but for 4L at a time. It lasts 2 of us 2 weeks – and we each drink abut 4oz a day. 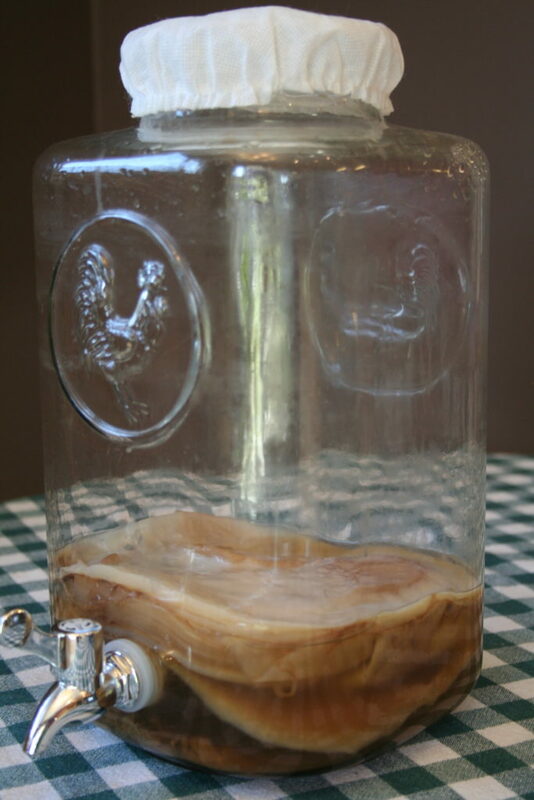 Your best bet is to get a piece of SCOBY from someone who has one going. 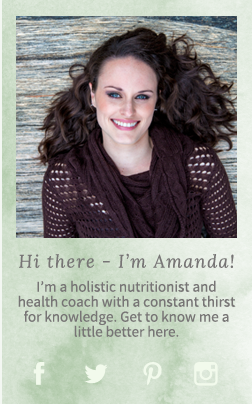 Alternatively you can rehydrate one from a company like Cultures for Health. 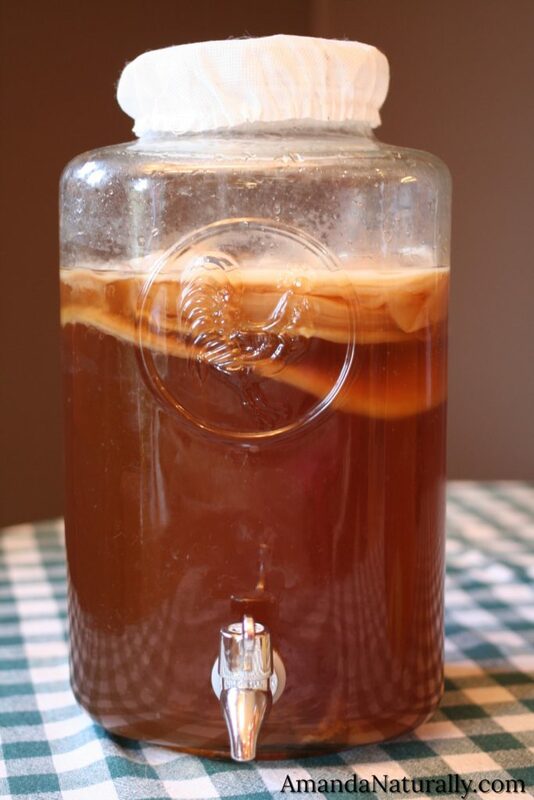 Apparently you can create a SCOBY by following the above process with a bottle of plain, store-bought kombucha too. 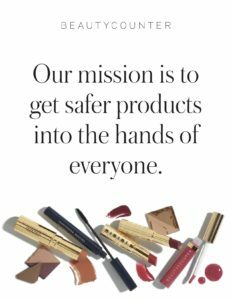 But I’ve never done it, so you’ll want to google that! You need to use sugar cane, not honey. Honey can introduce undesirable bacteria. Most of the sugar gets eaten up by the SCOBY. If you let your ‘booch go too long, don’t throw it out. Instead turn it into jello jigglers – just make sure to add honey to combat the vinegary taste! I saw dr. Beaty today and I was gifted a scuby , thank you very much. I read the instructions above how to make a Kombcha. 1. Yes. filtered water is important. Tap water is NOT ok. 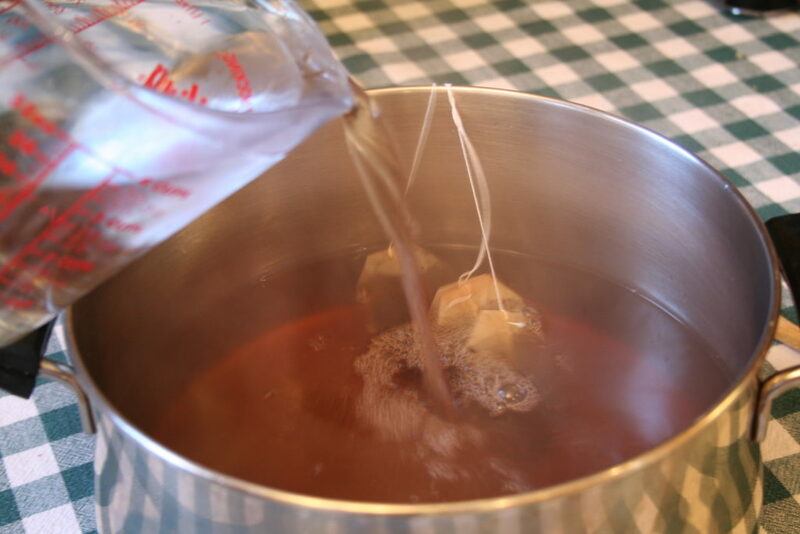 It has chlorine in it to kill bacteria, which will kill the SCOBY. 2. As per the instructions, start with 1L. The ratio of pre-made kombucha to new kombucha is important. 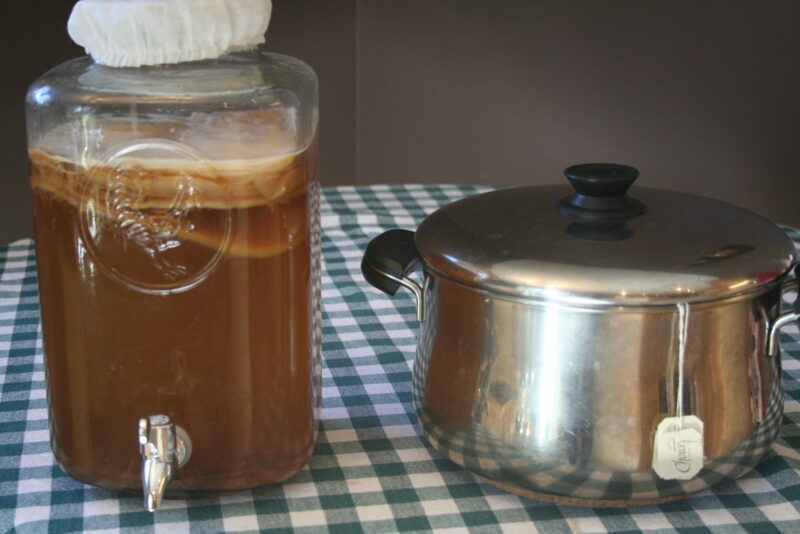 You have about 1 cup of pre-made kombucha, so it will only make 1L of new kombucha to start. 3. Yes, it will grow. You can gradually increase over a few months. The first 3 or 4 times, make 1L. 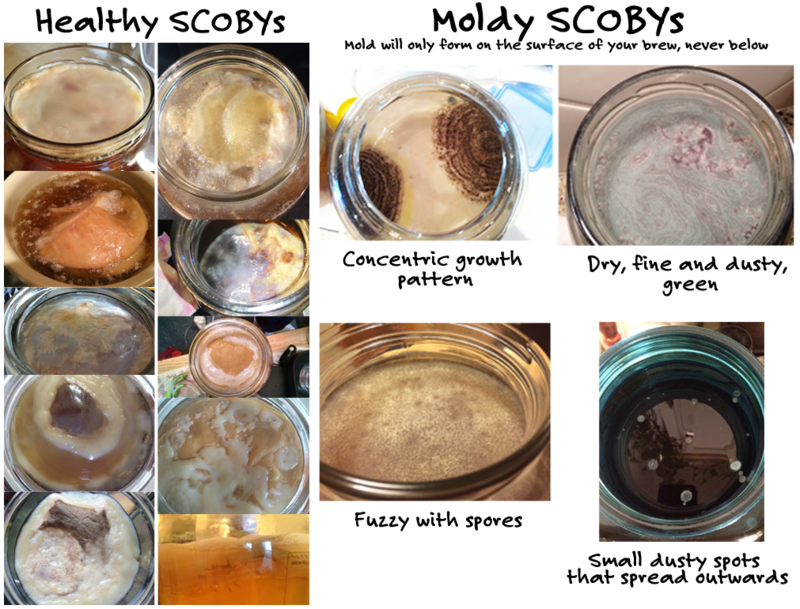 You will see the SCOBY growing. After 2 months you can probably start making 1.5L. 4. It will probably take you at least 1 year to grow enough SCOBY to have 2x 4L containers going like I do.